Meet the Rat Terrier, a lively and affectionate breed. Whether at work on the farm or at home snuggling with family, these dogs make exceptional companions. The Rat Terrier is truly the "Heinz Fifty-Seven" of the dog world. That's because for the last century, these dogs have been more of a "type" than an actual breed of dog. These dogs are a compilation of many Terrier breeds, with a few non-Terriers thrown into the mix to bring in other desired qualities. These Terriers were bred to be agile farm dogs capable of killing all sorts of vermin. Although they are willing to occasionally track rodents underground, they are at their best above ground where they have room to make high speed maneuvers and catch prey with their strong jaws. Since Rat Terriers have so many breeds in their ancestry and no common breed standard until 1995, their appearance varies slightly throughout the breed. Members of this breed are muscular, but not muscle-bound, and appear slightly rectangular in profile. Their heads are wedge-shaped and the ears may be folded over button-style, or pricked. Tails are moderate in length and may be docked if desired, but some individuals display the natural bobtail gene. Coats are very smooth and shiny. Some dogs are all white, others have patches of color, but all must have some white coat on their bodies. Feisty and fearless is a fair description of this breed. 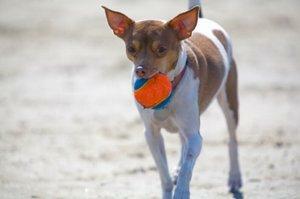 Rat Terriers can be live wires, and make fun and affectionate family companions. They are quite good around children, especially when they have been raised together.These Terriers also love the water and are intrepid swimmers, so exercise care around swimming pools. Even the best of swimmers may drown if there is no way for them to get back out of the pool once they've jumped in. Since these dogs are so eager to please their people, training is usually an easy process. Obedience training is good for establishing that extra amount of control needed when your pet spots rabbits and squirrels outdoors. These cunning canines also excel at dog agility, a fun activity for pets and owners. Of course, their forte is still field work and they usually make a respectable showing at Terrier trials. Few breeds enjoy the good health and long lives that these Terriers do. These little fellows frequently live fifteen to eighteen years. Because their breeding pool has remained open for so long, they have benefited from fresh genetic input. Although this has resulted in a less than uniform look throughout the breed, many breeders and owners feel that their pets have gained far more than they have ever lost. These dogs do not appear to be plagued with any genetic disorders at this time. Currently, Rat Terriers are considered a rare breed by the American Kennel Club, but not everyone wants recognition. The two main breed clubs disagree over how a closed breeding registry will affect the breed. The RTCA is currently working with the AKC, while the ARTA believes closing the gene pool will eventually result in many of the same genetic disorders that have become so prevalent in other pure breeds. It's possible we'll see the same kind of split in this breed that was experienced in the Jack Russell Terrier fancy when one branch accepted AKC recognition, while the other branch chose to carry on by itself. Are Rat Terriers the breed for you? They do seem to get along well with nearly everyone, but need to be supervised around smaller pets. Their convenient size and affable nature makes them well worth your consideration for a family companion.